The “CardioLog Usage Reports” SharePoint Feature enables you to view usage reports from within your SharePoint website, via the "Site Actions" menu. For more information see "View CardioLog Analytics Reports from SharePoint's "Site Actions" Menu". 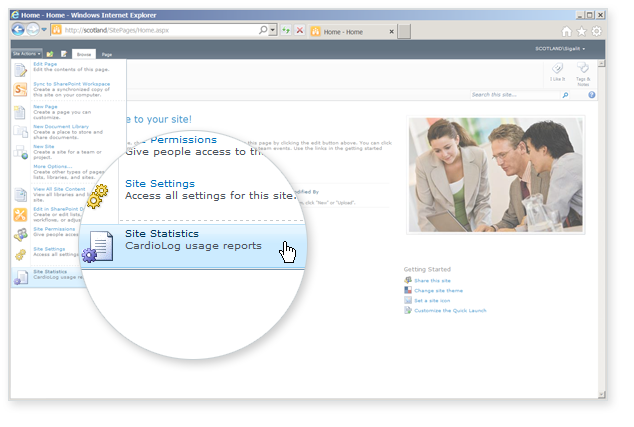 Note: The "Site Statistics" option will be added to the Site Actions menu and visible to everyone with the specified permission level in the SharePoint site. .
Go to Site Actions > Site Settings > Site Collection Administration > Site collection features > Activate the "CardioLog Usage Reports" feature. Perform IISRESET on all SharePoint WFE's. <add key="EnableSpSecurity" value="true" /> Mandatory - value should be true or false. To enable SharePoint permissions inheritance value should be true. <add key="SpSecurityClaimsAuthentication" value="" /> Optional - value should be true or false. When using claims based authentication in SharePoint value should be true. <add key="SpSecurityPermissionLevel" value="" /> - Optional - value should be a SharePoint permissions level. If none selected, "Full Control" will be used and only users with full control access to the SharePoint site will have access to the report. SharePoint 2007 and SharePoint 2010 - "Full Control", "Design", "Contribute", "Read", "Limited Access"
SharePoint 2013 - "View Only", "Edit", "Approve", "Manage Hierarchy", "Restricted Read", "Restricted Interfaces for Translation"
<add key="SpSecurityCheckWebAppPolicies" value="" /> - Optional - value should be true or false. Enable this only if permissions are given from central admin through policy and not directly from the site. <add key="EnableSpSecurity " value="true" /> Mandatory - value should be true or false. To enable SharePoint permissions inheritance value should be true. Note: If you would like to uninstall the Site Statistics feature, please deactivate it first on every site collection.